Let yourselves guided to the discovery of the immense natural, historical and cultural heritage of the City of the sun and all Sardinia as well. 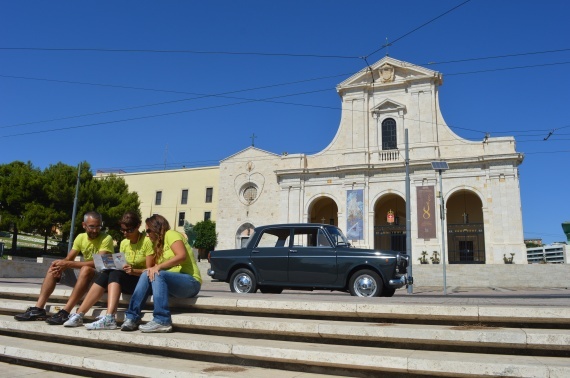 With the Viva Cagliari Tour you will have the opportunity to choose tours by vintage car or by e-bike. Viva Cagliari Tour born from the desire to convey the love for our mysterious, pristine, diverse island, rich in traditions and breathtaking views, and its Phoenician, Roman, Pisan, Aragonese, Spanish, Piedmontese capital, or, in simplest of synthesis, Cagliari. Chock full of history, tradition, museum, breathtaking views, Cagliari is one of the most beautiful cities in the Mediterranean sea. We are eager to share the very best of our city with you. See with us Castello district with its St.Marie’s cathedral, his pisan’s tower like the Elephant’s Tower, its walls and ramparts where the overlooking is amazing. Enjoy a visit to Villanova district, home of the most important brotherhoods and picturesque flowery streets. And no less important Marina and Stampace are waiting you to complete the visit to the city with their narrow streets full of mysterious and multi-ethnic corners, and countless small shrines where tradition, flavours and fragrances excel. TOUR 1 HOUR: City hall – San Pancras’s Tower – Palace Square/ San Mary’s Cathedral – Elephant’s Tower/Jewish Ghetto – Sant’Remy’s rampart – Church of San Giacomo/Villanova. TOUR 2 HOURS: City hall – Church of Sant’Efisio – Castello/San Pancras’s Tower – Palace Square/ San Mary’s Cathedral – Elephant’s Tower/Jewish Ghetto – Sant’Remy’s rampart – Villanova/Church of San Giacomo – Church of San Saturnino – Our Lady of Bonaria’s Church. TOUR 2 HOURS: Stampace/Church of Sant’Efisio/Church of Santa Restituta – Castello/San Pancras’s Tower – Palace Square/ San Mary’s Cathedral – Elephant’s Tower/Jewish Ghetto – Sant’Remy’s rampart – Villanova/Church of San Giacomo. TOUR 3 HOURS: Stampace/Church of Sant’Efisio/Church of Santa Restituta – Roman’s amphitheatre/San Pancras’s Tower – Palace Square/ St. Mary’s Cathedral – Elephant’s Tower/Jewish Ghetto – Sant’Remy’s rampart – Villanova/Church of San Giacomo - – Church of San Saturnino – Our Lady of Bonaria’s Church – Church of Santo Sepolcro.